September 11-17, the Bald Eagles Rifle Club hosted the 2011 Spirit Of America rifle match, at the NRA Whittington Center in Raton, NM. This match serves as U.S. National Fullbore Championships, but there are also F-Class divisions. The match consists of conventional sling (TR) class, as well as F-Open and F-TR, and the event is shot at distances of 300, 500, 600, 800, 900 and 1000 yards. Approximately 80 shooters, including about 20 F-classer attended the event. Bryan Litz won the Fullbore TR (sling) competition with a 1782-105X overall score, with runner-up Andrew Wilde (1780-101X), just two points behind. Sean Morris finished third with 1776-85X, and Jim O’Connell shot 1772-81X to claim the High Senior title. In F-Open Class, familiar names topped the leaderboard. Larry Bartholome earned his chair ride as F-Open winner, shooting an impressive 1776-98X. Second in F-Open, five points back at 1771-96X, was past F-Class National Champion Danny Biggs. In the F-TR division, Michael Smith topped the field with a 1738-69X, followed by John Killen, who shot a 1720-52X. NOTE: F-Open and F-TR competitors shoot a target with smaller-diameter scoring rings than the Fullbore Target. Bryan Litz credits his 155gr Berger .308-cal Hybrids for his strong performance: “I was shooting the new Berger 155 grain Hybrid bullets which played a part in saving some points in that nasty wind (on the last day). Due to their length, these bullets require a 1:12″ twist to stabilize and have a higher BC than any other .30 caliber 155 grain bullet. The hybrid ogive makes them length tolerant (insensitive to seating depth) and as the results of this tournament show, they are very effective”. You’ll find complete interim and final SOA Match Scores linked from the Bald Eagles Match Blog. Saturday and Final TR (Fullbore Sling) Class (PDF). Saturday and Final F-Open and F-TR Class Results (PDF). 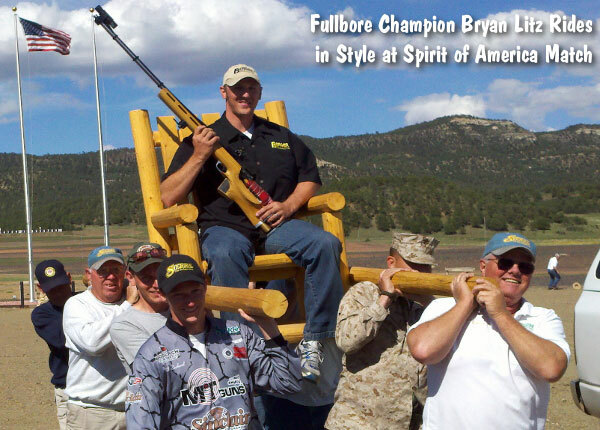 Share the post "2011 Spirit of America Results from Raton, NM"
Get ready for a major new technology that could change the benchrest game. Carlos (Carlito) Gonzales, a benchrest shooter (and Professor of Engineering) from Argentina, has perfected a horizontal, external “floating” cartridge loader that can reliably feed PPC cartridges as fast as you can work the bolt. We have received a report that Gonzales’s fast-feeding device has been approved by the NBRSA for use in benchrest matches. Pascal Fischbach told us: “I had an email September 17th from Gene Bukys, [stating] that the board of directors of the NBRSA approved the use of the ‘[Gonzales] manual cartridge feeder’ for use in NBRSA competitions.” [Editor’s note: We don’t yet know if the device is approved for all NBRSA benchrest matches, or just short-range matches.] Pascal added: “The device was presented at the delegates meeting of the WBC11 in France and approved for use during the World Championships. The next step for Carlito will be to market it. He is also willing to license the concept, plans, and methods to a machinist capable of manufacturing it in the USA.” See Discussion Thread. The Gonzales loading device is an open-ended, covered metal tray situated on the left side of the action (but it does not touch the gun — it is supported by an arm attached to the front rest). This feeds into the left-side loading port. The cases are gravity-fed, but the shooter has positive control over feeding. A cable with a push-button control runs from the magazine down to the rear foot of the pedestal rest. You just push the button to drop one cartridge from the magazine. We don’t know exactly how the cartridge is released in the magazine itself, but in the video below you can see how the push-button works. You push the button as soon as a spent cartridge ejects (watch Carlito’s left hand in the video above). It is a clever set-up that works very, very fast. The video shows Carlos running five cartridges through his action in just 9 seconds (time marker 00:31 – 00:40). That’s fast! On a repeat viewing focus on Carlito’s left hand to see how he works the push-button cartridge dispensing control. Credit to Pascale Fischbach for sourcing this story and video link. Share the post "NBRSA Approves Quick-Loading Tray for Benchrest Competition"